I have included a spreadsheet here of around 500 sundials, sorted by local Council, that I have constructed from detail recorded by the RCAHMS (Royal Commission on the Ancient and Historical Monuments of Scotland). 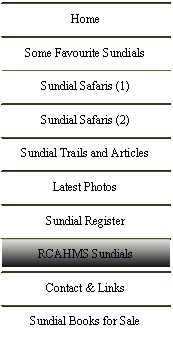 It has the additional benefit of links from each dial to the relevant dial in the RCAHMS website, which has in some cases significant additional detail on the dials such as descriptions and grid references, and in other cases absolutely nothing. However many of these sundials now appear to be missing. It has been an invaluable tool in my research.